I can’t make sense of any of the numbers and abbreviations, so I study the graph. 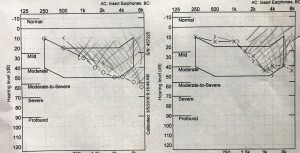 A line starts in the upper left at point labeled “normal,” and descends at a roughly 45-degree angle down and to the right, ending below the point labeled “moderate-to-serve.” This line roughly bisects a blocky crescent-shaped graphic that resembles a weight-and-balance envelope. The bottom part of the line is outside of the envelope. But this isn’t weight and balance, and most of the line is within the envelope, so there’s probably nothing to worry about. At least, that’s what I tell myself until the doctor comes in to explain the results of my hearing test. He whips out a pen and with careful, deliberate hash marks greys out everything above the line. “This is how much hearing you’ve lost,” he says. More than half the hearing in my right ear. A good third of the hearing in my left. Ah. So that’s why everyone’s mumbling recently. If you ask any pilot my age (over 55) what’s the biggest change in aviation they’ve seen in their lifetimes, you might expect them to say the advent of the glass cockpit. But it’s not. That’s just technology. Since the Wrights, aviation has been one tech leap after another: Radios, gyroscopes, the primitive “beam” navigation systems, VORs, autopilots, GPS, digital instruments, glass. It’s the nature of pilots to quickly adopt new toys, and it’s been that way for over a hundred years. No, the biggest change in in aviation in my lifetime is the headset. In my youth, and for the decades of flying prior to that, no one took any serious action to protect their hearing. It wasn’t from a lack of technology, although like all else, that has improved. No, it was a matter of culture. Pilot culture. We just didn’t wear headsets. I’m not even sure why, but it just wasn’t done. And I’m not quite sure how it happened, because culture is hard and slow to change, but now everybody wears headsets, and a good thing, too. But it’s too late for me. Now I’m paying for the sins of my youth… Or I will be if I can afford to. The insistent, slightly maddening ringing in my right ear is, ironically, caused by the fact I can’t hear anything worth a damn with it, according to the doc. Well, “ringing” doesn’t really describe it. It’s a high-pitched electrical sort of noise, deep inside my ear. It almost seems to come from the right third of my skull. It varies little in tone, although the volume varies throughout the day from barely noticeable to loud enough to block out conversations. It’s worse after flying, especially following long cross countries, and ironically much, much, much worse when wearing noise-canceling ARN headsets, instead of the old-fashioned passive models. It was largely this ringing in my ear that brought me to the audiologist. I mean, I knew I was having some difficulty following conversations around the dinner table, and I’ve had a few comical miscommunications with Starbucks staff at various airports, which I am only now understanding were due to my lack of hearing, not to their lack of proper command of the King’s English, as I had previously assumed. 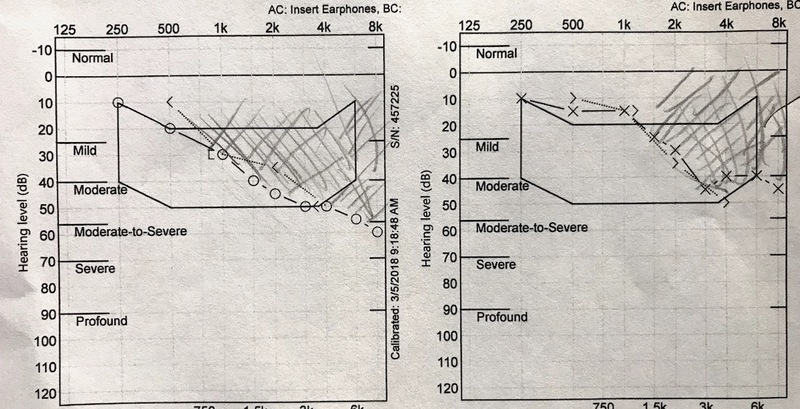 The good news, the doctor cheerfully tells me, is that my sort of hearing loss responds to simply “turning up the volume.” Of course, as we can’t turn up the volume on the entire universe without annoying the neighbors, I need hearing aids. He gives me a thick packet of information on my various options. I deposit it in the circular file, unopened, as soon as I get home. You see, my health insurance—like most—doesn’t cover hearing aids and I can’t afford them. The cost of one set of hearing aids of the type I need is equal to five annual inspections. (After owning a plane for a few years you’ll find that any time you think of money, it will be through the lens of aircraft maintenance costs.) So that’s not an option. At least not right now. So I’ll turn up the TV. Ask my wife to speak up. And tell the girl at Starbucks that I’m hard of hearing, could she please repeat what she just said? And I won’t worry if the engine sounds a little less loud. Unless it goes totally silent. Then I’ll execute an emergency landing. Or pony up for the hearing aids. This entry was posted in Plane Bummer, Plane Past, Plane Scary by admin. Bookmark the permalink. Welcome to the world of aviation ….. excuse me could you say that again? The problem with hearing aids is…they often do not work very well. My wife is on her third set and I told her to tell her Audiologist that if I have to repeat everything I tell her three (3) times, he is going to refund our money. This approach seems to be working well for me as my wife is now reluctant to admit she can’t hear me with her new hearing aids. She doesn’t want to ask the Audiologist for a refund. As usual, I enjoyed and appreciated your writing. Unfortunately, I am experiencing the same issues as you are. Hope that our children learn from our mistakes and protect their hearing instead of acting invincible as we did.